HOW TO UPLOAD AND POST PICTURE HERE!! 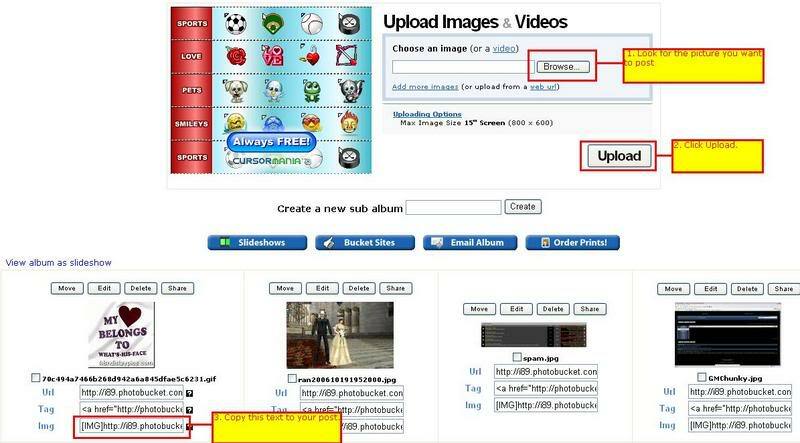 If you wish to attach images on your post, you can use 3rd party photo hosting sites like image shack, photobucket, etc. A majority of these sites are free to join. Just become a member of the photo hosting site of your choice. Login there, upload your photos and then use the link of the photos together with the IMG tags from this forums. 1. PictureTrail (http://www.picturetrail.com/) - Registration needed. 3. ImageShack (http://imageshack.us/) - For direct image hosting. No need to register. 1 - Copy the URL/link then use the BBC tag for "Insert Image". Alternatively, if you want to display your image in a separate window, use the BBC tag for "Insert Hyperlink" instead. 2 - Copy the entire code to your post. No need to use the tag for "Insert Image" since it is already a BBC tag itself. 1. Right click the picture.